"A Keyblade that courses with mystic power." 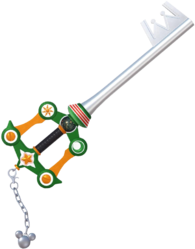 Dawn Till Dusk is a Keychain for Sora's Keyblade in Kingdom Hearts III. Dawn Till Dusk is a 7-Eleven-themed palette swap of Kingdom Key W. 7-Eleven is a Japanese-owned international convenience store where the Dawn Till Dusk was available as pre-order bonus. Its handle is black with both ends capped with orange. The guard is green and orange, with the edges at the bottom tipped with orange circles and the edges on the top capped with a sun parallel to the teeth and a moon on the other side. The base of the blade is green with red stripes running on the side. The coloration is a reference to the 7-11 logo; as is the name; From dawn (7am) til dusk (11pm). The blade, Keychain, and token are identical to the Kingdom Key's. ↑ Available to those who pre-order the game through Amazon in North America. ↑ Available to those who pre-order the game through 7-11 stores in Japan.